This was an easy 2 points for Bangor junior No. 10 Matt Fleming. Hampden senior No. 34 Ian McIntyre tries to block Bangor junior No. 24 Jason Smith from getting any closer to the basket. Hampden players on defense as Bangor juniors No. 10 Matt Fleming and No. 2 Damien Vance exchange the ball. Hampden senior No. 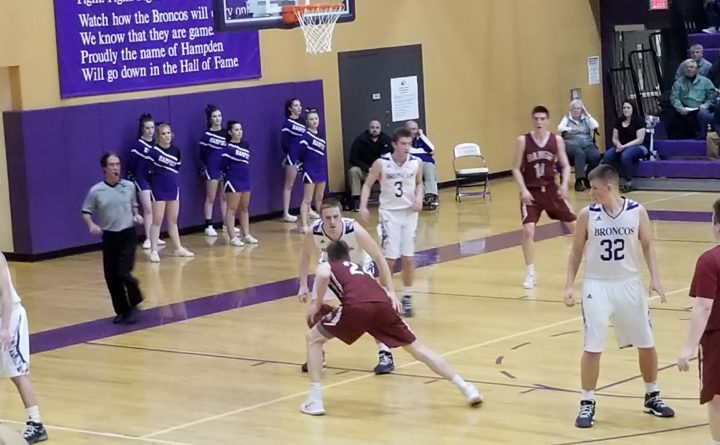 32 works to keep possession of the ball under pressure from Bangor sophomore No. 11 Henry Westrich. Hampden junior No. 3 Kory Winch and Bangor junior No. 10 Matt Fleming face off as Matt looks for an opening. 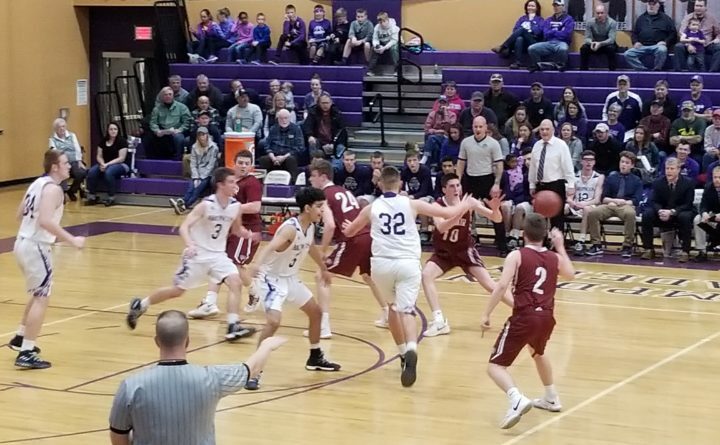 HAMPDEN — Hampden Broncos and Bangor Rams varsity boys played a high energy game Tuesday evening, Feb. 6, at a packed Hampden Academy. 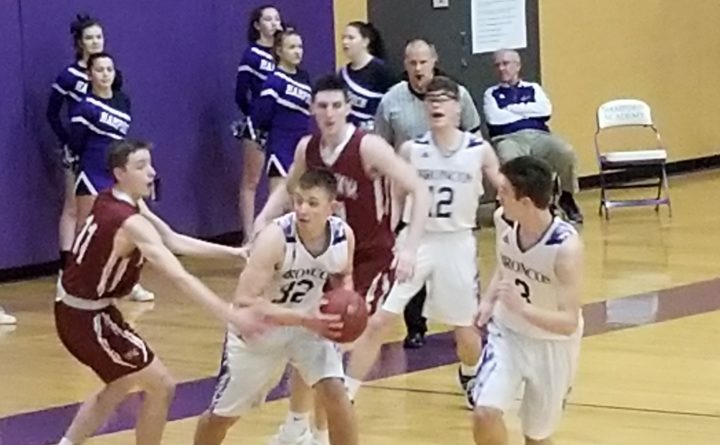 The score stayed close for much of the game, but Hampden kept its lead with at least a six-point, and often 10-point, spread. Bangor junior No. 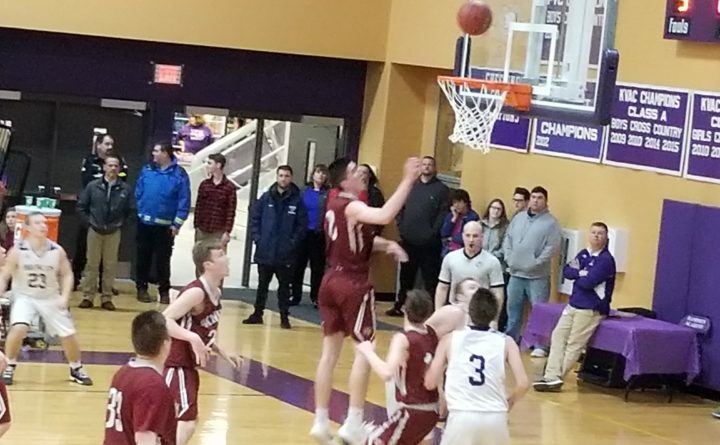 10 Matt Fleming tossed a three pointer at the buzzer, which brought Bangor up to 73. The final score on the scoreboard was Hampden, 80, and Bangor, 73. Read details in the story by Ernie Clark. Also just before the game, it was Senior Night for Hampden Cheerleaders. Recognized were Zoye Bishop, Paige Clifford, Erin Davenport, Madison Elliott, Sadie Ivers, Grace Plaisted and Alexis Spaulding. High school sports fans, you may submit game photos of your favorite players in action. You don’t need to be professional photographers. Cell phone photos are fine. 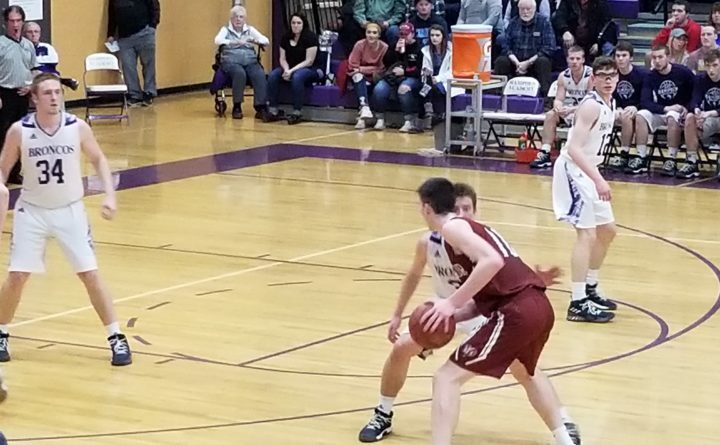 Use the Submit your News form link at the top of the page to submit your .jpg photos, including what game and the date it was played. If you have questions, contact Community News Editor Julie Harris at jharris@bangordailynews.com or 990-8285.